If you come here and read more than two words, you’re probably a lover of poetry and fiction. You’ve hit the jackpot this week. Here are a few good reads (in no particular order). I hate to put them all on one post, because they deserve much more attention. But if I wait until I have time to do them all justice, a year might roll by. Some are just coming out. Some I meant to shout out ages ago. They’re all good. ….Poiesis #4: I just ordered a copy. Woot! Poiesis #4 is a poetry chapbook (compilation of various authors), edited by leah angstman of Propaganda Press. I’m not going to wait to read it before I recommend it, because everything leah does is awesome. I know it is good. And it’s only four bucks plus shipping! You can get all of the details about Poiesis #4 and easy ordering HERE. by leah angstman. Propaganda Press. Yes, leah is an excellent poet, too. I love her voice and her style. Some Misplaced Joan Of Arc blew me out of my seat. It is one of my favorite chaps of all time. But I love both of these poetry chaps. Propaganda Press titles are affordable, which is one of the reasons I’m a big fan. But the MAIN reason I’m a fan is that they are good. Order No One Gains Weight In The Shoulders HERE. 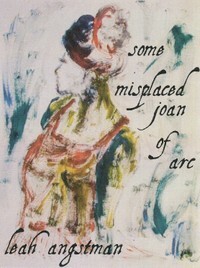 Order Some Misplaced Joan of Arc HERE. 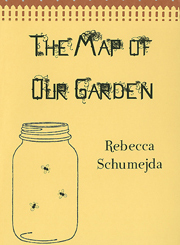 …The Map of Our Garden by Rebecca Schumejda. 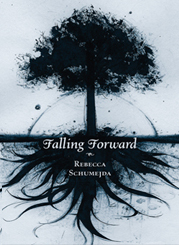 ……Falling Forward by Rebecca Schumejda. The Map Of Our Garden is fantastic–and probably one of the most physically beautiful chapbooks I’ve ever seen. It even comes with a bookmark in a pocket on the inside back cover. It’s obvious the editor takes great care with what she presents. I do love it. But I wouldn’t mind if Rebecca’s words were written on a paper bag. She is an amazing poet. The beautiful presentation just makes it that much more of a pleasure. Falling Forward is equally as beautiful. The poetry is excellent. I plan on coming back to tell you more about both of these books. But why wait for me? Order The Map Of Our Garden HERE. Scroll down and take a look at the images of the chap. Take a look at some reviews and information about Falling Forward HERE. Open A Real Book Reviews. You can also see more of Rebecca’s books at her site. The next must buy on my list is Dream Big, Work Harder. I love that title! Male, Pale and Old: 16 Outstanding Men of the Small Press. Edited by Jenifer Wills of Literary Mary, this online journal is exactly what it says. Outstanding. Powerful work. And it’s free to read by clicking HERE. What more do you want? Great work that’s free! Be sure to read it all. And read Jenifer’s introduction, which explains how she came up with the name for the zine. It’s right on. I love the cover, too. The desk sort of looks like mine, but it’s a lot neater than mine is. 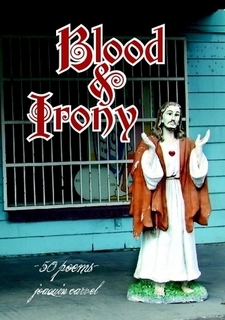 ….Blood & Irony by Joaquin Carvel. Joaquin is one of my blog friends and is an awesome writer (both poetry and fiction). Joaquin has heart and soul. I dig that. I love Joaquin’s voice and stories. We are on opposite ends of the country, but Joaquin feels like kin. You can order Blood and Irony by clicking HERE. You can also read more of Joaquin’s work at Lyrics and Maladies. Joaquin also has a poem recently published at The Smoking Poet. And another excellent poem at Deuce Coupe. Coffee Machine is one of my all-time favorite Joaquin Carvel poems. Go read it now. You’ll see what I mean. And be sure to check out Blood & Irony. Have you ever read a poet’s work and felt as if you would really like that poet as a person? I don’t know Ed Galing, but I wish I did. He’s open and honest, and his words always stop me in my tracks. Ed Galing has been through many things (born in 1917), and his poems tell it all. I love his work. Order OUT ON A LIMB HERE. OUT ON A LIMB and DINER are also Propaganda Press chaps, and you can find more of Ed Galing’s books in the catalog. Glenda Council Beall is one of North Carolina’s finest poets. I know that’s a big statement to make, but it is true. She doesn’t waste a word, and her poems are pure music. Glenda’s poetry touches my soul. But you don’t have to be a Southern writer or poet to enjoy Glenda’s work. It reaches across all geographic boundaries and paints a picture of humanity. You can read more of Glenda’s work at Writing Life Stories. Scroll down to Glenda’s October 6, 2010 post and read the poem Tomato Man. You’ll see why that’s one of my favorites. Tomato Man was the winner of the 1997 Clay County Arts Poetry Contest. It is also included in Now Might As Well Be Then. You can also read more about Glenda and read her poem Miracle of Love at Scott Owens’ Musings. I love how he calls Glenda a “MVP” or “Most Valuable Poet.” It’s so true! Order Now Might As Well Be Then HERE. James is another one of my blog friends, and I know him as JR of JR’s Thumbprints. Now, before you go thinking I just shout out people because I know them from my blog…take a look at his site. James Tomlinson works as a teacher in a Michigan prison. He sees more in one day than many people see in a lifetime. Week after week, I wonder how he does it. His words are powerful. James Tomlinson is one of the best flash fiction writers I have ever read. And the book is only four bucks! Motor City Burning Press does a great job of bringing us good reads at low prices. HERE is one of James’ recent stories at Staccato. The first story in Adopted Behaviors is posted at Sleet Magazine. It is called The Trigger Man and His Accomplice, and you can read it HERE. You can also read more by checking out his site. Click on his link and look on the right sidebar for places where his work has been published. Anything Kell Robertson has ever written. Okay, I just had to mention Kell Robertson again. You knew I would didn’t you? He’s the greatest. Speaking of Kell, check this out. Yep, it’s him. Cool and Dark Inside is his song. I have the CD, and it’s awesome. I don’t know who Bob is, but I love him for making this video. It’ll probably look weird here, because I don’t know what I’m doing. But take a listen if you can. There are many more books I want to tell you about. But there’s just so much my squeaky wheel can do in a free hour. I’ll try to be better in the future. Be sure to bookmark the links. I highly recommend it all. Hi, Lorenzo. Thanks for checking it out! Have a great weekend. hey julie gal. ive been a fan of propaganda press ever since u put up the post about christopher cunningham. good stuff. i remember you told me about rebeccas books, but im an old man & forget so thanks for the reminder. i love male pale and old. im still checking the others out will let u know my favorites. they all look great. thanks a million times for giving me these worlds. Hey, Dan. I knew you were going to check out Male, Pale and Old first, because of the title. Haha! But seriously. Thanks so much for reading. I appreciate it. And I look forward to hearing your impressions. on October 8, 2010 at 7:01 pm S.R. Why are you posting on Friday? You threw me. I love everything you have recommended to me in the past, so I’ll forgive you. It looks good. I’m checking it out. Love the Kell video! Hey, S. Sorry about throwing you. The most number of people usually come here to check for me on Mondays or Tuesdays (at least according to the numbers). I might not be around on Monday or Tuesday. I hope so, but just in case, I wanted to make sure it’s already up when the most people come around. I’m not as stupid as I look. Haha! Thanks for checking it out. Ain’t that Kell video awesome??? I just stumbled on it the other day. You’ve got his books, right? Let me know what else you like, okay? Have a good one! Thank you for all of the links. I’ll be taking a look later this weekend. Tonight is band parent volunteering, and we leave soon to help serve dinner! Hi, Annie. I was just thinking about you. I’m sorry to be slow to visit you this week, but I will be there (you know I will). I’m headed out myself for a while, so I understand having to leave. I hope the band dinner goes well for you. Thanks again for the exposure! You rule! Thanks, leah! You’re so right about Rebecca. Everything she does is amazing. I love all my books, but some of them are real treasures that I read over and over. Actually, I was thinking I should have bought two copies of hers and yours, because they’re getting a little beat up where I have handled them so much. That’s a nice thing, though. It means they get read a lot. Another thing I should have mentioned about Amanda Oaks is how nice she is. I don’t know her personally, but I was afraid my bank account would bounce if I used Paypal. So I e-mailed her through her site and asked if I could mail cash. I was sort of embarrassed to ask, but she was very kind about it. I received the book promptly, too. But I will add it to this post, as well as to the sidebar. I will definitely check out “Nothing Unrequited Here” by Heather Bell. It sounds great. Thanks so much! Thank you for those nice words about my poetry. I will check out the others mentioned here. Your guest post on my blog, Writing Life Stories, http://www.glendacbeall.blogspot.com led many new readers my way. You are invited to do it again whenever you want. I completely trust your recommendations and look forward to reading the others in your list. Hi, Glenda. You’re very welcome. I enjoyed doing the guest post and will be happy to do it again anytime. “Now Might As Well Be Then” is EXCELLENT, and I really hope everybody will check it out. I’ve been meaning to put up a post about it, but life kept pulling me away. It is also one of my favorite chaps for many reasons. In case anyone thinks it’s “just” for Southerners…it’s not. It did touch that special place in my soul, but “Now Might As Well Be Then” is for anyone who enjoys good poetry. It’s called “The Trigger Man and His Accomplice.” I’ve been getting a favorable response from it. Once again, thanks. Now I’ll have to investigate some of these poets / writers and their links. I’m sure I’ll be envious, as always. Peace. Hi, JR. The link is great. I will add that to the post above, too. I’m not surprised that it is getting a favorable response, because “Adopted Behaviors” is awesome. I wasn’t kidding when I said that you’re one of the best flash fiction writers I’ve ever read. It is a skill and an art that many people try, but only few can bring to life. You do that so well. And not just with flash. Your short stories are excellent. Everybody please hit the link and CHECK IT OUT. 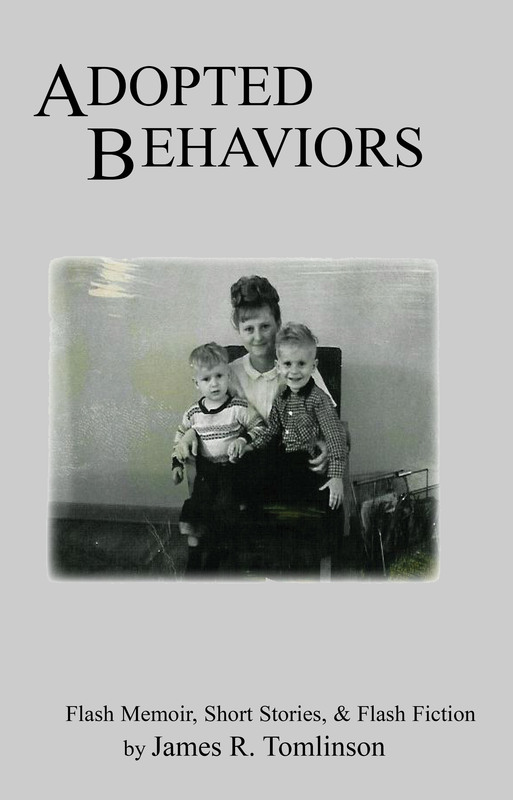 And do check out “Adopted Behaviors.” It’s only four bucks! I don’t know about anybody else, but low prices are a big deal in my world. When prices are low and the work is excellent, it can’t be beat. Another job well done. This was a surprise and a great one. Your readers are grateful. I will also make these links and check them out. You took some time between posts and I was wondering what project you were working on. It was hours spent doing service to poets and readers alike. Okay, that’s it, now keep it coming. And, thank you, Julie. Thanks so much, Jack! I’m so glad that you’re checking everything out. I really can’t take credit for being a great philanthropist, though. Part of my slowness is typical Julie slowness…haha! But your words are very kind, and I do appreciate it. As I was posting, I was thinking that you would like certain ones, and I look forward to hearing your impressions. Joaquin’s “Coffee Machine” rocked my world. Be sure to take a look. They’re all good. But I try to recommend what I think each individual reader will like. Since you do beat, I thought you might enjoy it. I sure did! Thanks again, Jack. Have a good one. Hi, Tipper. Thanks for stopping by. I love hearing from Glenda’s fans. I am a big fan, too. She is awesome! I’m hoping to do another post in the future to highlight all of Glenda’s work and accomplishments. I love her voice and style. But I do hope everyone will check it out now. “Now Might As Well Be Then” is EXCELLENT WORK! What a whopper of a line up here! I’ve been wanting to roll up my sleeves and dig into some poetry chapbooks & journals, now, with you as guide, I’m all set. Thanks for the links & introductions, feels like Christmas today, this post and all the poetic goodness wrapped up in it! 🙂 And this post proves you are truly a student of words, as a student not only writes, but reads (and then some!). Happy week, can you believe it’s October already?? Hi, Terresa. It’s always so good to see you, sis. October? I thought it was August…haha! There aren’t enough hours in the day, are there? Thanks so much for checking it all out. I know you’ll find a lot to enjoy. Be sure to check out “The Map Of Our Garden.” Again, it’s ALL outstanding. But I think you’ll enjoy the theme (family, parenthood, love, nature etc.). There are even some dirty dishes in there:) I love how Rebecca takes the everyday moments in life and makes a large and beautiful statement. I know you’ll love it, too. Thanks again & have a great week! had to come back to say thank u again. im loving it. u were so right. ed galing is the man. one last time & i will go away. i just emailed u my poem. its not great or anything but while i was writing it, i let go of some old anger. what an experience. u are a generous & kind poet, julie gal. i love the other work u share, but u will always be my favorite poet of all time. Dan!! I’m so glad you wrote the poem! Thank you so much for sending it to me. I can’t wait to read it. I just checked my in box and saw your name in there. I’ll go read it right now! Thank you also for the kind words. I’m so happy that writing the poem was able to help you let go of some old anger. Ain’t it awesome how writing can do that? Yay, Dan! You rock the world, brother. I’m so glad you checked him out! I have an extra copy of “Diner” if you’d like it. I’ve been saving it for somebody who would really appreciate it. Okay, ’nuff talk. I’m heading back to read your poem and will e-mail you soon. That is a great list – as usual. I hope to be able to look at some of the books at least…though lately I had been so slow with reading, writing and comments. Because you guys and gals all rock so much and seem to be so into the poetry, I’d like to give you a little treat from Propaganda Press, since two of my own books were mentioned (leah angstman), among others from our press, as well. We here at Propaganda Press understand that not everyone can afford poetry books, no matter how cheap we try to price them, so I’m offering a special freebie, only for the readers of Julie’s blog who happen to read these comments. Thanks so much for letting me include you. “Coffee Machine” ROCKS MY WORLD! And that’s not to dis any of your other work, either. It’s all good, and I hope everybody will check it out. I just thought of something. I should have linked your story up there, too. Argh…I can never get my act together. But I’ll get it up there, so everybody can see your fiction (which is also excellent). Hey, leah! Thank you so much! You rock my face off, woman! I was just in here yakking and saw you pop in. That is awesome news and much appreciated. EVERYBODY READ LEAH’S COMMENT ABOVE. FREE POETRY FROM PROPAGANDA PRESS! Leah Maine of Finishing Line Press http://www.finishinglinepress.com mentioned your site on her Facebook page when I told her my book was listed on your Good Reads. You are a generous writer and we appreciate you. Thank you, Glenda! And please thank Leah Maine of Finishing Line Press for me. I appreciate you, too. It has been a pleasure to “meet” you here, but I hope to someday be able to hear you read in person. Someone e-mailed me today and said she is very interested in “Now Might As Well Be Then.” I do hope she will take the time to purchase it, because she will be thrilled. It is beautiful, powerful work! Three cheers for Leah & Propaganda Press! Hey, Terresa! Yes! Thank you for that cheer, sis! Cheers to leah angstman of Propaganda Press! I have read your blog since the beginning. I used to think “THIS CHICK IS NOT FOR REAL,” because there’s no way a poet could be so frigging nice. I kept reading, because I think you’re one of the best poets out there today. Then I met you at an event. You were so genuinely frigging Andy Taylor nice (and pretty). Shocked the hell out of me. I was wrong. There are nice poets in the world. Thank you for all of this great work. Hey, anon. I’m more like Ernest T. Bass than Andy Taylor. I’m so glad I didn’t sign off for the night yet. Your comment cracked me up. Thank you! Event? I’ve been to one event in the past year that I can think of, because I won free tickets. Haha! Or was it an oyster roast? Anyway, I’m glad I was on my best behavior when you met me. The meds must have kicked in by then. Thanks again. I do appreciate it. Now go read the books before I take a stick to you! If you’ve been reading here since the beginning, you KNEW I couldn’t shut up with just one comment back…haha! Seriously, thank you. I’m not so nice sometimes, but I try…maybe too hard. I have a horrible temper and an evil side that I try to hide. I guess that’s human, though. I can’t remember meeting you, but thank you for being kind. It will come to me eventually. Hello Buffaloe, I love Kell, I’m from New Mexico & his video was better than enchiladas in Santa Fe. I love Rebecca’s book & all of leah’s stuff at Propaganda, she recently did a book of mine called Making Love To The Rain. Maybe someday you can write me up or down. Mil gracias. Hey, Catfish. It’s nice to meet you. I’d be glad to write you up. I’ve seen you all over the small press world and like your work. I haven’t read your chap yet, but it’s on my list to buy. I’ve got a list that I had to put in a notebook, because it’s so long. So I’m a little slow sometimes, especially when I’m on the road. Now everybody is laughing, because I said I’m a “little” slow. I’m a lot slow. Haha! P.S. – If anybody reads this and doesn’t want to wait for me, Catfish’s chap is in the Propaganda Press catalog. Just hit the links by leah’s books, and you’ll see it there. Hi, Christopher. Sorry it took me so long to get your comment up. I’m just returning from a trip and had no internet for a while. I was actually wondering if that was your typewriter. I should have asked. But I love it. I love that cover…and, of course, the work is awesome. I also love that somebody still has a typewriter. One of my friends sends me letters on an old manual, and it is the most awesome gift. It’s an experience to get his letters. Thanks so much for dropping in. It’s great to see you. I hope all is going well in your neck of the woods.